I’m not sure if you would believe me if I told you I have figured out how to make the most perfect French fries with no oil and no deep frying. But I have. I was so tired of trying to fit store bought French fries that never come out crispy enough or fatty restaurant French fries into my diet so I set out to make my own macro-friendly fries. Let me be honest. I’ve O.D.’d on sweet potato fries. I’ll eat them but I’m over them. At the beginning of my pregnancy when I was super nauseous I went to the Crossfit Games, and at the time was a strict paleo eater. I was at the games for basically a week and because the vendors assume that sweet potato fries are what crossfitters want because they are “healthy”, that’s all there was to eat. So that’s what I ate, and proceeded to feel that disgusting pregnant sick. So now I associate sweet potato fries with that feeling. And, as always, let’s be real. Just because sweet potatoes are technically paleo. It doesn’t mean that they’re any healthier than regular fries. They’re still fries people and deep fried. Go ahead and eat as much as many as you want and as frequently as you want and see how that goes for you. I’m always looking to fit the most amount of food into my day without skimping on things I like and the flavors I want. I love fries. When I eat a burger, I want fries. When I eat steak, I want fries. What’s better than steak frites??? So I’m going to give you my secret to the most perfect homemade French fries that are super macro-friendly. Believe me, you can eat your fill and then some without the guilt – they will fit in your flexible diet no problem. 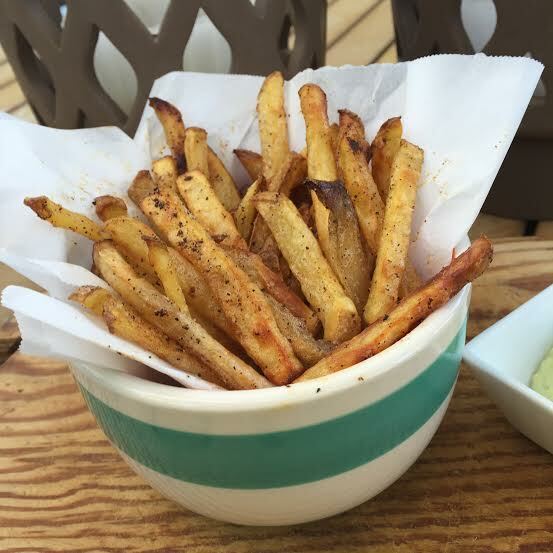 And, even if you aren’t a flexible eater, these are still the most perfectly crispy fries. My husband told me they could be mistaken for fries served in a restaurant. I’ll take that! What makes them macro-friendly is the type of potato used and the lack of oil. You can easily switch out the type of potato and use a sweet potato or russet potato. I just personally prefer the taste and texture that a Yukon gold potato gives these. You can also use a variety of cooking oils to lightly coat the fries and help the seasonings stick instead of non-stick spray. The lack of oil simply takes away the fat content of this side dish. It’s called flexible eating for a reason. The choices are up to you, depending on how you want to make it fit. If you make them my way, I bet you could fit eat two servings worth and still be solid on your carbs for the day. What makes them perfect is the preparation and cooking process. The combo is #winning. Wash and dry the Yukon potatoes then prepare a bowl of cold water with ice cubes and set aside. Cut the potatoes into 1/4 inch slice disks first, then cut lengthwise into approximately 1/4 inch fries. Do not peel the potatoes! The skin adds to the flavor and aesthetics. Soak the raw fries in the bowl of ice water for approximately 45 minutes. This will remove a lot of the starchy content of the fries and help them crisp up easier. Line a large baking sheet with tin foil and place a cooking rack with a small grid on top. Coat the rack with your non-stick spray of choice. Take the raw fries out of the water bath and lay across multiple paper towels and let them dry out a bit. Pat dry with extra paper towels. Place the raw fries on the cooking rack and spread evenly. Again, lightly coat the raw fries with non-stick spray. Sprinkle with a generous amount of salt first. Then season with a light coating of garlic powder. Last, sprinkle pepper and dusting of paprika for added flavor. The more paprika and garlic powder you use, the more “seasoned” flavor you will achieve for the fries. This is personal preference. Bake the fries for approximately18-20 minutes and check to see how they are browning. Depending on how many fries you are cooking and your oven’s consistency the time may be more or less. When your fries are about 3/4 of the way cooked through pull out the fries, take them off the rack and put them directly on the baking sheet. Season with an additional small sprinkle of salt and put back in the oven for an additional 15-20 minutes. I recommend you keep your eye on the fries from this point on. I check every 5 minutes or so to make sure that they do not get over cooked. We all know the consistency of a perfect French fry so use your judgment on when to pull them out. You want that happy medium between crispy brown edges and a soft middle. Just be vigilant about monitoring your fries and they should come out crispy and perfectly seasoned! I made these fries for my super picky family who make it difficult to cook non or low fat meals that taste good. These fries were a HIT! We all loved them and I can’t believe how crispy and tasty they were without using any oils. Thanks Kelly, another successful recipe from your blog.